The Bay of Plenty region's Treaty of Waitangi landscape is complex and dynamic. Māori are an important sector of the regional community. They make up a third of the population in the Bay of Plenty and own 37 percent of land. Several iwi have received large financial and cultural redress through Treaty of Waitangi settlements, and many others will be settled in the future. As partners to the Treaty of Waitangi, Māori have particular constitutional rights and interests. These are expressed now, not only in law but in the way in which they engage on a global level representing Aotearoa through their culture, language and matauranga (Māori knowledge). Māori have a role to play in the future wellbeing of the Bay of Plenty and it is their contribution alongside their aspirations that will benefit us all. The Waitangi Tribunal has held 17 historical inquiries across the region identifying Treaty breaches. Iwi have used these reports to support negotiations of several comprehensive Treaty settlements with the Office of Treaty Settlements. Settlements for Bay of Plenty iwi have included the return of land and resources, and have sometimes been accompanied by the establishment of joint resource governance, including Rotorua Te Arawa Lakes, Rangitāiki River and Kaituna River. Our role under the Treaty of Waitangi is becoming even more relevant as Bay of Plenty hapū and iwi go through the Treaty claims and settlement process, during which we can provide support and advice. Settlement legislation can include triggers for further engagement and involvement with local Māori through Statutory Acknowledgments, Deeds of Recognition, Memoranda of Understanding, and Joint Governance, and/or Co-Management agreements. In the current Treaty climate, settlements with Bay of Plenty iwi have become vital. Council must maintain enduring relationships with Māori, particularly when the Crown’s involvement in the settlement process ceases. For more information on Treaty settlements in the region contact staff from the Māori Policy section. The Treaty of Waitangi Toolkit (below) has been developed to increase the awareness of Council staff in relation to the Treaty of Waitangi. The Bay of Plenty region's Treaty of Waitangi landscape is complex and dynamic. Waitangi Tribunal Inquiries and Treaty settlements covering Fisheries and historical claims have been active and a priority in the region since the 1980s. In the region, several comprehensive Treaty settlements have been achieved including Ngāti Awa Settlement 2004, Tūwharetoa ki Kawerau (Bay of Plenty) Settlement (2004) and the Te Arawa (affiliates) Settlement 2008. 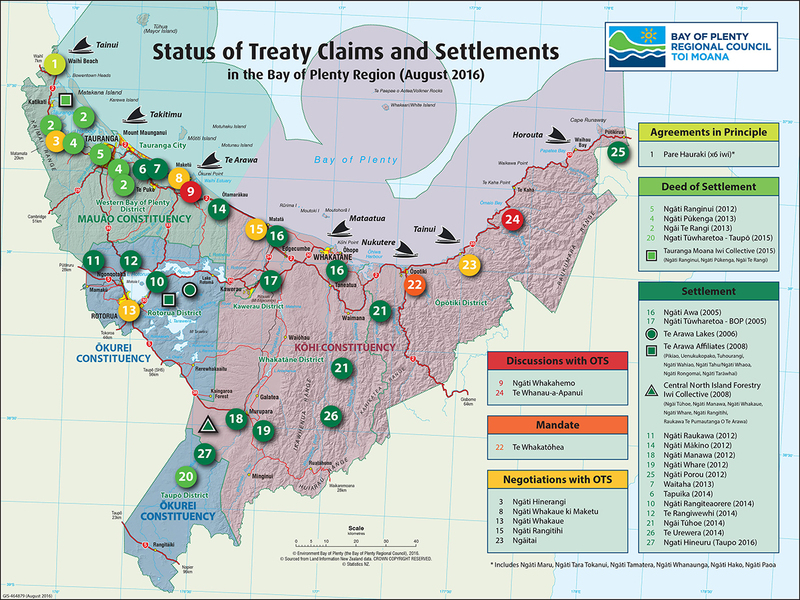 On-account Treaty Settlements also include the Te Arawa Lakes Settlement (2005) and the Central North Island Iwi Collective Crown Forest Settlement (2008) and the Te Arawa River Iwi Settlement (2010). Te Arawa Lakes Settlement has been one of the most significant, providing a co-governance model to manage the Te Arawa lakes under the Rotorua Te Arawa Strategy Group. It is the first co-governance model established between iwi and Councils over a natural resource in New Zealand. Ngāti Whare, Ngāti Manawa, Ngāti Mākino and Waitaha recently signed respective Deeds of Settlement with the Crown. Ngāi Tūhoe, Ngāti Rangiwewehi, Ngāti Rangiteaorere, Tapuika, Ngāi Te Rangi, Ngāti Ranginui and Ngāti Pūkenga are negotiating towards settlement milestones in the near future.